[0:04] <puff> redrabbit: I meant that to address Skaag's comment about another app writing a different value to the same file. [0:42] <puff> Hm, does motion fit on a pi zero? [0:43] <puff> Looks like google thinks it does. [0:47] <puff> How good is the pi 3 at java? [0:47] <puff> I wrote a desktop video stream viewer in java, I'm wondering if I could use it on a pi as a sort of appliance, i.e. plug the pi into a TV HDMI etc. [4:52] <enzobarrett_> Can I ask a question? [10:48] <mlelstv> that's something only you can know. [11:28] <gordonDrogon> redrabbit, install wiringPi: sudo apt-get install wiringpi then gpio -g mode $pin out ; gpio -g write $pin 1 - easy way to set a pin high. [12:04] <gordonDrogon> I doubt that a 64-bit Pi would work any better as a server than a 32-bit one does. [12:06] <gordonDrogon> for the Pi ? not likely. [12:08] <mfa298> with people still pushing out 32b arm boards all over the place I doubt 32b arm is going any time soon. [12:12] <gordonDrogon> er not until now. [12:14] <juozapas> could somebody give me hint what might be wrong ? [12:20] <mlelstv> does iwconfig show that you are connected? [12:22] <mlelstv> has no problems with them..
[12:25] <juozapas> so does it mean that it works ? [12:37] <ShorTie> can't use raspi-config ?? [12:41] <Armand> gordonDrogon: I meant in general.. 32b support is dying. [12:43] <gordonDrogon> Ubuntivity, yes, possibly. you'll need to connect it to a pwm output or another gpio pin and use e.g. a software one generator. [12:43] <gordonDrogon> Armand, probably. shame though. I think 32-bit still has a long way to go. [12:45] <gordonDrogon> Ubuntivity, using a pwm output pin? [12:45] <gordonDrogon> Ubuntivity, ok - what are you using to drive it? you'll need to send it a square wave. [12:46] <N3LRX> That's not a buzzer, it's a speaker. [12:46] <Ubuntivity> gordonDrogon: I have a code that generates square wave, I used it to control DC motor speed. [12:47] <gordonDrogon> looks like a little pizeo disc thing - maybe it's a speaker? Got a meter? check the resistance..
[12:47] <Ubuntivity> I'll have to go get a meter. What resistance should a buzzer give? [12:47] <gordonDrogon> a piezeo wil lbe infinite. [12:48] <Ubuntivity> gordonDrogon: Like a short circuit? [12:48] <gordonDrogon> no infinite - like an open circuit. [12:48] <Ubuntivity> while a speaker shows some resistance since it has a coil? right? [12:48] <gordonDrogon> if it's a speaker it wil lbe between 4 and 120 ohms typically. anything over 64Ω will be ok - well ok in that it will work, but maybe not ok for the pi in the long run. [12:50] <Ubuntivity> gordonDrogon: What do you mwan 'in the long run'? [12:55] <Ubuntivity> So, I believe it IS a piezo thingy. Will a piezo also be "not ok on the long run" ?? [12:55] <Ubuntivity> Also, does a piezo has +ve & -ve polarity?? [13:01] <Ubuntivity> mlelstv: this tutorial says that the resistor is optional. Can I safely go without resistor? [13:03] <mlelstv> depends on the piezo, but I would just put it in for safety. [13:04] <mlelstv> no need for the exact value, it could also be larger, the piezo will have a few hundred kOhm or even MOhm. [13:16] <Ubuntivity> mlelstv: or, what might happen if I do not connect a resistor? [13:20] <Ubuntivity> mlelstv: if so: would that resistor protect my Pi from that effect? [13:21] <mlelstv> no idea if 100 Ohm is enough. But since the value hardly matters, I would use maybe 10kOhm. [13:22] <Ubuntivity> mlelstv: would a 2N2222 transistor give a better protection? [13:23] <Ubuntivity> would its base also need a resistor?? [13:24] <mlelstv> you may also want a diode. [15:21] <Encrypt> linux_dream, Is the printer a LAN printer? [15:51] <mlelstv> it's an automated backup that lets you recover older version or deleted files easily. [15:53] <mlelstv> a regular backup isn't much different. [15:53] <mlelstv> I use a standard backup tool to copy files off my systems. [15:54] <mlelstv> underneath it runs 'dump' or 'tar' to do the copying. [15:54] <mlelstv> amanda is just the thing organizing it. [15:55] <mlelstv> I do weekly backups of my systems and the copies go to a central disk. [15:56] <mlelstv> you usually want something with a better network than rpi. But rpi could do it too. [15:56] <mlelstv> I have a small Atom based PC for that. [15:58] <mlelstv> how does mps-youtube play the videos? [16:00] <mlelstv> I guess it could work. [16:02] <mlelstv> maybe not all streams, the gpu supports only some codecs. [16:44] <Encrypt> Do you know how reliable it is to use an ethernet connector on a prototype PCB? [17:36] <mlelstv> should be fine, if anything it reduces maximum cable length. [17:42] <pwillard> I'm looking for some guidance. I have a Pi2 running Jesse and I want to use USB-Serial Adapter for a console. NOT the dang GPIO pins... (which every google result seems to feed me). I have a USB-Serial Adapter with a DB-9 connector for a terminal. [17:43] <mlelstv> that's difficult. You can use it to have a login session, but 'console' implies low-level access even while booting, USB won't work then. [17:49] <pwillard> Of course my notes say "modify Inittab" and that just make me shake my cane and say get off my lawn now. [17:52] <pwillard> For way way too many years. Started with Unix in 1981. [17:53] <mlelstv> so why not change inittab? [18:03] <mlelstv> where would there be USB? [18:05] <pwillard> WTF does everybody have an issue with this? Now you sound like every google result I got. I have a terminal... with a RS232 interface. A real one. So I have a RS232 to USB adapter. The system See the TTYUSB0 device... I just want to login with it. [18:05] <mlelstv> pwillard, yes, just start the getty service as I wrote above. [18:07] <pwillard> I'll try it. [18:07] <mlelstv> you may also need a null-modem cable / adapter. [18:08] <pwillard> I've been a telecom engineer since 1979... I have that part under control. [20:14] <gordonDrogon> pwillard, you'll need to solder the wires to the right connector though. [20:15] <gordonDrogon> redrabbit, glad you're going! [20:15] <pwillard> Gah, The point is... I have VT220 Terminal... with RS232 and in my hands I have a USB-DB9 adapter. The GPIO pins makes interfacing more problematic. [20:16] <gordonDrogon> you need one with a max232 chip in it. 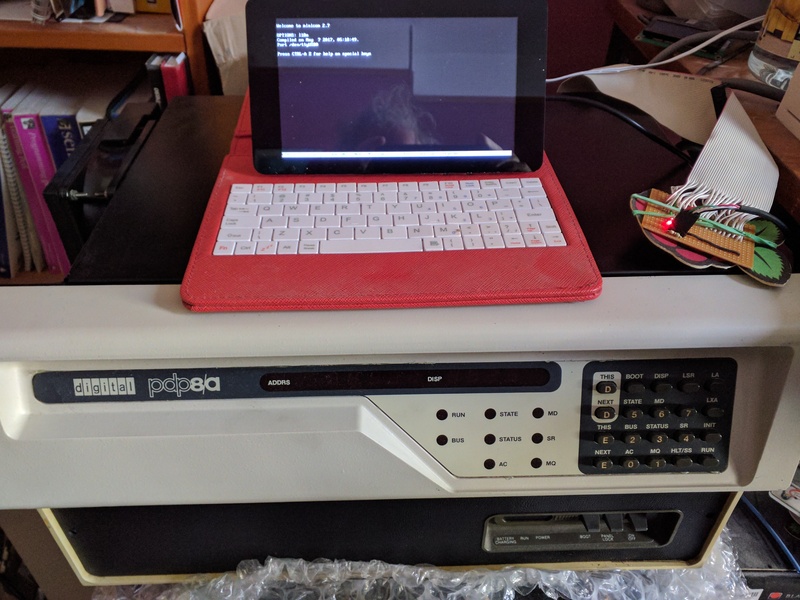 [20:17] <gordonDrogon> I solved that issue for my pdp8 by hacking the IO board to bring TTL serial out which is what I connect to. [20:18] <gordonDrogon> and fwiw, I have /etc/inittab with jessie, however I also don't have systemd..
[20:28] <zleap> what sort of keyboard do you need ? [20:29] <gordonDrogon> I think the 5 series used standard ps2 keyboard thing. [20:30] <pwillard> Keyboards are the issue. [20:30] <gordonDrogon> The old AT one? [20:31] <gordonDrogon> zleap, DEC keyboards have a weird offset latch/tang connector thing. [20:32] <gordonDrogon> ah, maybe that's why they are quite rare then. [20:33] <gordonDrogon> might stick to my Pi + 7" display solution then ... for now. [20:34] <gordonDrogon> which is actually quite handy for the pdp8 as I use it to download code into it.